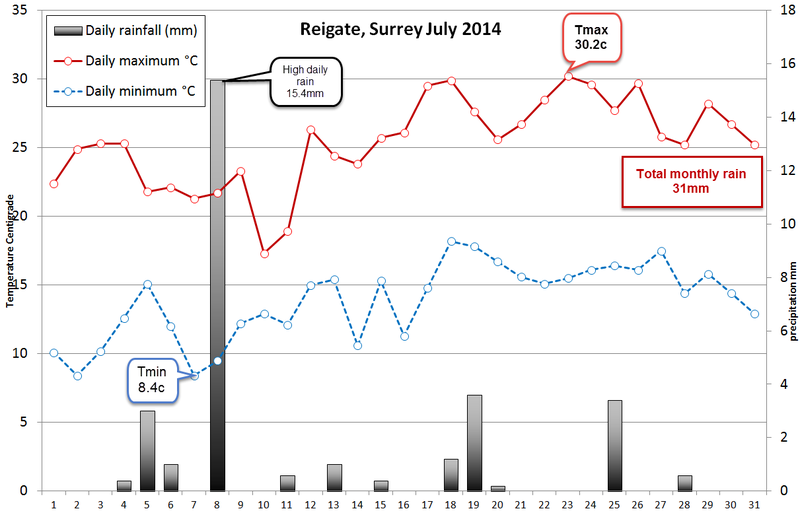 Total rainfall 31mm, with half of that falling during storms on 8 July. July 2014 was notable for significant thunderstorms and a particularly spectacular meso-scale convective system (MCS) that drifted up from France and across the Channel on 18 July and then again on the 28 July with attendant shelf clouds and torrential rain and amazing lightning displays across much of the SE. Whilst Reigate saw some thundery activity neither storm impacted significantly in Reigate, skirting further east, but did cause some spectacular lightning. Flooding and hail was notable along the south coast, especially Brighton. RGSweather was on holiday (typical!) so missed the action directly but will collect some links to add below. Any local photos available gratefully received.